Kilo White Series Review - Daily Vaping Deals & The Best Vape Product Reviews at Vaping Cheap! In this e-juice review, we’ll be covering 3 out of 3 flavors of the new Kilo White Series! Kilo is one of the most well known e-juice brands in vaping, and have brought you tons of flavors that are considered to be all day vapes by many vapers.This is one of the latest e-juice lines coming from Kilo E-Liquids, and they are only offered in 60ml glass bottles. In addition, each of these flavors have a 70VG/30PG blend, which is great for both tanks and drippers! The nicotine strengths available are 0mg, 3mg and 6mg. Before getting any further into the Kilo White Series Review, I would like to thank The Sauce LA for sending these e-juices our way for the purposes of this review. We will provide you with our overall thoughts about these flavors and let you know whether or not we recommend them! Remember, taste is subjective, so what we may like you may dislike and what you like we may dislike. We will first go over the specific mods and atomizers used to test each of these flavors and then will continue on to the review of Kilo White Series! Shop Kilo White Series Here! Click Here to Check Out Kilo White Series! Flavor Description: A toasted marshmallow with a slight hint of caramelized enhancement to create a delectable savory dessert unlike any other. And as always, handcrafted to perfection. This is a pretty good flavor that is a bit sweet yet it’s a bit light overall. On the inhale, you get a marshmallow flavor. On the exhale, you get the same marshmallow flavor, that does taste a bit like a toasted marshmallow and you get faint hints of caramel and rice crispy cereal. The caramel is very faint, and it’s a bit difficult to pick up at first. The marshmallow flavor is certainly the most dominant throughout the entire vape experience, and it is quite tasty. The notes of caramel linger in the background, and on the tail end of the exhale is where you taste the rice crispy cereal. This vape is not overly sweet, which is a good thing. The throat hit is silky smooth, and the vapor production is great considering it’s a 70VG/30PG blend. It actually looks a bit thicker than 70VG/30PG to be honest. Overall, Marshmallow Crisp is a tasty marshmallow dominant flavor. If that’s something you’re a fan of or interested in trying, I do highly recommend giving this one a shot! Flavor Description: Uniquely crafted with an emphatic staple of American’s childhood, featuring a combination of delectable vanilla ice cream with an intangible bliss sandwiched between two freshly baked chocolate cookie for the ultimate indulgent flavor. And as always, handcrafted to perfection. This is a spot on chocolate and vanilla ice cream sandwich vape, and when you smell this e-liquid, that’s exactly what it smells like which is pretty impressive. On the inhale, you mostly get a chocolate flavor with hints of vanilla. However, on the exhale is where this flavor really shines. You first get the same chocolate note, but it does have a cookie taste to it, and it’s followed by a vanilla ice cream flavor. This is probably the most spot on flavor I’ve tasted with this specific flavor profile, and it’s absolutely delicious. The chocolate flavor is the most dominant throughout the inhale and exhale, but it’s not too overpowering where you can’t taste anything else. This e-juice is blended incredibly well, and tastes like if you just bit into two chocolate cookies with ice cream in the middle. All in all, Ice Cream Sandwich by Kilo White Series is an excellent vape, and would satisfy any vaper’s sweet tooth. The throat hit is smooth a 3mg, and the vapor production is solid. If you’re a fan of chocolate and vanilla vapes, seriously give this one a try, you won’t be disappointed. Flavor Description: A phenomenal dessert blend with a warmly baked dough dusted with cinnamon for the perfect cinnamon roll, topped with a velvety rich cream cheese frosting. And as always, handcrafted to perfection. I will state this right away, if you’re not a fan of cinnamon flavors, then you might not like this e-juice. With that being said, on the both the inhale and exhale, you get a cinnamon roll flavor, but on the exhale there is a creaminess to it, which I assume is the “rich cream cheese frosting” in the flavor description. The cinnamon in this e-juice is a bit on the “spicy” side, so there is a slight kick to the cinnamon note, but it’s not overwhelming by any means. You do get the bakery note, which makes it taste like an actual cinnamon roll. I do wish there was a bit more creaminess on the exhale, but regardless it’s still a spot on cinnamon roll flavor. The cinnamon flavor is the most dominant throughout the entire vape, but the throat hit is very smooth, and the vapor production is excellent. All in all, this is a pretty spot on cinnamon roll flavor that is quite tasty. Like mentioned previously, I do wish there was some more creaminess to it. It might happen with some more steeping time, but not entirely sure. Regardless, it’s still a very enjoyable vape, and for those vapers who enjoy the same type of vape will probably agree. So if that’s something you’re interested in or favor, then I definitely recommend this e-juice. 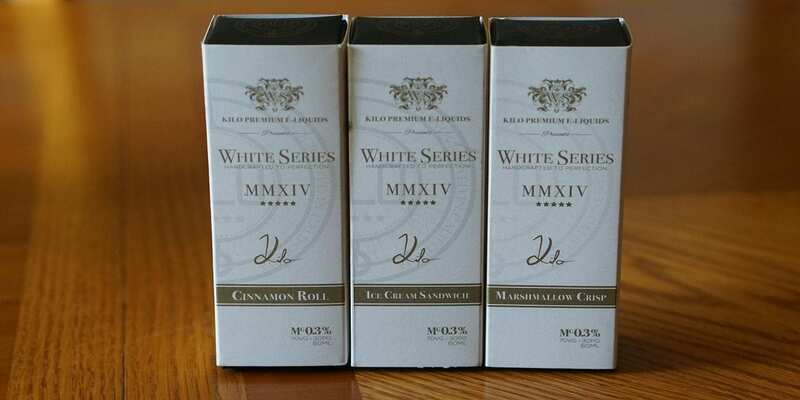 All in all, Kilo White Series is an excellent addition to the Kilo family of e-juices. All of these flavors are well balanced and stay true to the flavor description, which is something you’d expect with any premium e-juice. In addition, the throat hit from all 3 of these e-juices are silky smooth at 3mg, and the vapor production was quite impressive when considering they’re all 70VG/30PG blends. Our favorite from the three flavors reviewed was Ice Cream Sandwich, but the others were close behind. Ice Cream Sandwich is simply well blended and just tastes that good. If you’re a fan of Kilo e-liquids, then you’ll easily be a fan of this new e-juice line. At under $25 for a 60ml glass bottle, I do they they’re well worth the price tag as all of these flavors vape incredibly well. Overall, if you’re looking for a new premium e-juice to try and a fan of dessert flavors, then I do recommend Kilo White Series!